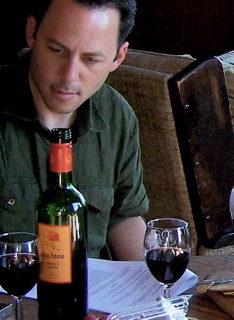 Few Point Reyes Light reporters have received as many awards as Ivan Gale (upper left) of Chileno Valley, winning five state and national journalism awards in 2004 alone. The Light’s new owner, Robert Plotkin, on May 3 announced he will no longer display the awards won over the years by Gale and other Light staff. 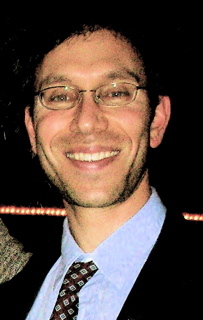 Gale left The Light to earn two master’s degrees from the Graduate School of Journalism at Columbia University. He is now a business writer for the Gulf News in Dubai, the rapidly growing financial and tourist center in the United Arab Emirates. 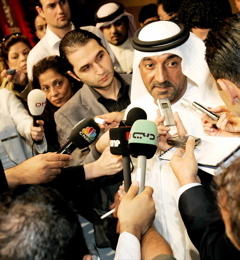 Here he attends a press conference where Shaikh Ahmed bin Saeed al Maktoum, the uncle of the ruler of Dubai, talks about Emirates airline’s annual results. When I sold The Point Reyes Light to Robert Israel Plotkin in November 2005, San Francisco Chronicle reporter Jesse Hamlin asked me how I felt about leaving the paper in new hands. Eighteen months have now past, and West Marin residents have repeatedly let Plotkin (at right) know he is not providing the community newspaper they need and expect. How much longer The Light can survive in its present form is now a topic of much speculation around the community. Nor is The Light the newspaper it appears to be. Some merchants have been mistakenly billed for ads that had been canceled, and Plotkin’s former printer Scot Caldwell has told others and me that a number of merchants are refusing to pay for these and other ads. Innumerable people have stopped subscribing to The Light — some as long ago as last year, but they have kept receiving the paper each week, Caldwell added. I have heard the same thing from dozens of readers who stopped subscribing to The Light months ago but continue to get it free in the mail. Meanwhile, with financial help from his landlord, Plotkin is in the midst of refurbishing his office while also publishing dozens of vapid, but relatively expensive, color photos and not paying off creditors to whom he owes significant amounts of money. When Plotkin’s debt to Caldwell’s Marin Sun Printing reached $11,000, the printer told me, Plotkin changed printers. Plotkin has now paid off $4,000 of that debt, but the damage has been done, and Caldwell will soon be part owner of a new weekly newspaper based in Point Reyes Station. More about that in a moment. Part of the legacy that Plotkin has taken off The Light’s walls are state and national honors won by Victoria Schlesinger (at left), who like Gale left The Light to earn two master’s degrees in Journalism from Columbia University. The May issue of Harper’s magazine published a whopping nine-page exposé by Schlesinger of the so-called Millenium Villages Project that is supposed to lead the Third World out of poverty. Ironically, Columbia’s Journalism Department paid her way to Kenya to investigate a pilot project run by the director of Columbia’s Earth Institute, Jeffrey Sachs. The former Light reporter revealed Sach’s project is a poorly administered fiasco which is trying to replicate a failed experiment from a quarter century ago. 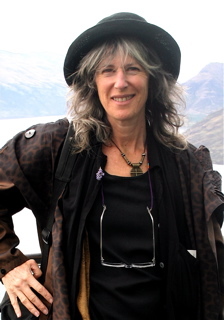 • Meanwhile, journalist Elizabeth Whitney of Inverness, who last December organized a community meeting to discuss The Light’s inadequate coverage of local news, is now organizing a public protest. “I think it is time to TAKE BACK THE LIGHT,” Whitney wrote in an announcement she began circulating last week. Plotkin’s malicious coverage of a deputy’s taking me into custody a year ago and having the county psych ward check to see if I was suicidal was “sleazy,” Carroll wrote in Monday’s Chronicle. Light reporter Micah Maidenberg, who wrote the story under Plotkin’s direction, knew all this from the public record, for I had emailed him copies. Maidenberg also knew the deputy went to my house after Plotkin made a bogus claim that I was suicidal. In addition, Maidenberg interviewed me, and I gave him straightforward answers. However, neither the facts contained in the public record, nor my answers to his questions, nor his boss’ involvement were included in Maidenberg’s story, which instead lumped me in with a violent man from Bolinas who was taken to the psych ward and attacked a doctor. • Maidenberg, by the way, is the same reporter who in March wrote the story identifying various Latino residents of West Marin as documented or undocumented immigrants. Community leaders including Sacred Heart Church’s Father Jack O’Neill, Toby’s Feed Barn owner Chris Giacomini and his manager Oscar Gamez, Marin Community Foundation director Carlos Porrata and his wife Rebecca, Point Reyes Books owner Steve Costa, Cabaline Saddlery owner Vicki Leeds, 13 prominent Latinos, and a number of other well-known townspeople have publicly questioned Plotkin’s “journalistic ethics” in publishing Maidenberg’s story. Not surprisingly, Maidenberg has given notice he’s leaving as of the end of this week. Maidenberg’s departure, however, is the least of The Light’s problems. 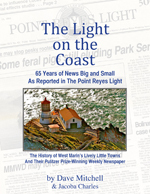 • Don Deane, publisher of The Coastal Post in Bolinas, has brought in Jeanette Pontacq of Point Reyes Station as editor. Under her, The Coastal Post has introduced color photos, is covering more West Marin news, and is picking up more advertisers. On Wednesday, Deane told me he and Pontacq are also discussing publishing twice as often, fortnightly instead of monthly. However, he noted, no final decision has been made. • One decision that is final was made by Joel Hack, owner of The Bodega Bay Navigator website, and Caldwell of Marin Sun Printing. They are about to start a new weekly newspaper in West Marin. Debuting Friday, June 1, will be The West Marin Pilot. At least that is its tentative name. The public will be asked to submit suggestions for the final name. Hack said the first issue will be an eight-page introductory copy. Each week from July 1 on, it will be published full size and sell for $1 a copy. Former Light editor Jim Kravets of Fairfax (left) will edit the weekly. Former Light advertising representative Sandy Duveen of Woodacre will sell advertisng. Caldwell told me Kravets and Duveen will both share in the ownership. Like Caldwell, both of them have had a hard time collecting thousands of dollars Plotkin owes them. As for The Navigator’s Hack, Plotkin is suing him and me for Hack’s letting me post items on his Sonoma County website. Plotkin has claimed that the postings violated The Light’s sales agreement in which I agreed not to work for another Marin County newspaper. In a ruling that defies common sense — and presumably the law — Marin Superior Court Judge Jack Sutro last fall ruled a Sonoma County website is the same as a Marin County newspaper and ordered me to stop posting on it. That ruling is now before an appeals court. Also planning to work for The Pilot are: Missy Patterson of Point Reyes Station, who for 25 years has handled the front desk at The Light; former Light historian Dewey Livingston of Inverness, who used to contribute West Marin’s Past; feature writer Ellen Shehadeh of Inverness, who had been a frequent contributor to The Light; obituary writer Larken Bradley of San Rafael, who had won a variety of state and national journalism awards while at The Light; and Charlie Morgan of Inverness Park, who covers sports events for KWMR, will be the sports writer. Well, it looks like THE DARK will be no more. As Dave Mitchell, and all the folks that worked at the old “WEST MARIN” POINT REYES LIGHT will go down in history. Plotkin, has started more sh-t in this town than anyone ever has — even all the cows. Is he really just plain stupid to continue to send papers to folks who do not want “his” paper sent to them? He is running advertising without permission and trying to bill those places. Where did this guy come from, and why is he still here? Yes, WE ALL NEED TO BE THERE ON JUNE 11. We have to let this stupid man know what he has done to “Our Community Paper.” I hope, Don Deane of The Coastal Post and Joel Hack of the new West Marin Pilot can get classifieds in their papers, and I hope the new paper will get this stupid man out of West Marin. Multiple thanks to those responsible for the new paper. I hear donation/subsciptions are being sent. I’d like to contribute. What is your mailing address? What an exciting life-affirming breath of fresh air this will be. The heart is returning to our sweet community. Thank you for turning on the light in this increasingly darkening room. You are sorely missed, but at least now I can find you from time to time. Your excellent blog lights up the screen on my computer, again, tonight! Thanks for doing this. I’ll be reading your posts whenever they arrive here. What a juicy scandal! But I noted that in the first “redesigned” issue of The Light, that there was a misspelling on the first line of the masthead- “West Marin’s Prize Wining Newspaper”. Whining indeed! Bad journalism comes with bad spelling, bad proofreading, and arrogance with regard to the community. Hey Dave – Thanks for the great news about the new newspaper. Can’t wait to read it. I sure enjoy your blog… It’s great to be able to read your writing once again! I’ve sent a link to your blog and the Pilot’s website: http://www.wmarinpilot.info to all my friends. Yea! Sending in subscription request today and have called all my pals in Dillon Beach. They’ll subscribe asap, too! Would love to be part of West Marin again, instead of the no-mans-land of Plotkinville. Just be sure we get our Sheriff’s Calls on Page 2 and go for it. Imagine, an actual newspaper, with editing, writing, local news and events. Can’t thank you folks at the new paper enough. How do I subscribe to The West Marin Pilot? This is in response to your photo of D Ranch. I spent many summer hours as both a child and a teenager on this ranch, as Vivien and Rudy [Horick] are my Aunt and Uncle. It’s heartbreaking to see the neglect this ranch has suffered. But what confuses me is where in the hell did the palm tree come from? I simply cannot dredge up a memory of a palm tree — abalone shells, peacocks, antlers, hay and plenty of cows but no palm trees. This was a wonderful isolated return to nature for a child who lived in the city and one that will always be a great memory. 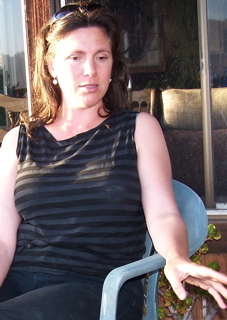 I also have to tell you that The Point Reyes Light was an excellent reporter of the hip huggers I wore on my visits there as a teenager…. Sparsely Sage and Timely is powered by	WordPress 4.9.10 and delivered to you in 0.800 seconds using 64 queries.